While Semrock manufactures the most durable optical filters available, it is important to note that all optical components are delicate and should be handled with care. Always avoid or minimize direct contact with any optic. If you are not handling a Semrock filter, check with your filter vendor to ensure that the use of cleaning chemicals and solvents will not damage the filter. Because Semrock supplies only hard-coated filters, all of Semrock's filters (even dichroics) may be cleaned using the following recommended method. 1) Blow off contaminants. Many contaminants are loosely attached to the surface and can be blown off. Using laboratory gloves, hold the filter in one hand. Always use a gentle to moderate air flow and maintain an oblique angle and remember to begin the air stream while pointing away from the filter first, then slowing move the air stream over the filter surface at an angle. Repeat this process on the other side of the filter. 2) Clean filter. If dust or debris remains, it is probably "stuck" to the surface and must be removed with mechanical force and/or chemical action. Create a firm, pointy tip with the lint-free wipe or lens tissue by folding it multiple times into a triangular shape or wrapping it around a swab. Lint-free swabs may also be used in place of a folded wipe. Moisten the wipe or swab with isopropyl alcohol or Acetone, but avoid excess solvent. If the wipe or swab is fully saturated, it should be gently shaken or dabbed on a wipe to remove excess drops of solvent. Remember to use a new wipe or swab with each cleaning attempt. IPA and Acetone each have benefits and drawbacks. Generally, more active solvents (like acetone) attack a broader range of contaminants more quickly, but also evaporate more quickly than gentler solvents. Acetone has excellent cleaning action but it dries very quickly and is thus much more susceptible to leaving behind residue on the surface of the optic. Furthermore, care should be taken when using Acetone around certain plastics and most adhesives, as these can also be dissolved by acetone. IPA may require the user to wipe multiple times to remove all contaminants but dries slowly, reducing the risk of leaving a solvent residue on the optic. Maintain continuous motion at a constant speed, but do not apply pressure to the swab or wipe. Some people prefer to clean using a "figure 8" pattern (shown below, left) while others choose to start in the center of the part and wipe outward in a spiral pattern (shown below, right). 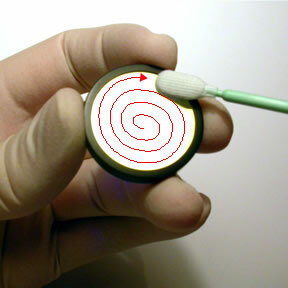 Each time the wiping motion comes to a stop, it is likely that residue will remain on the surface at that point, so maintain constant speed until the swab has moved off of the surface of the optic. Note: The optimal wiping speed is determined by the solvent and environmental conditions – the faster the solvent evaporates, the faster you should wipe (hence Acetone requires a faster wiping speed than IPA, for example). When wiping at just the right speed, you should see signs of the solvent evaporating on the surface only a few millimeters behind the moving wipe tip. 3) Inspect filter. Use a room light or any bright light source to inspect the optic to ensure that it is clean. Tip, tilt, and rotate the optic while viewing it as close to your eye as you can focus. If contamination remains, start with a brand new wipe or swab and repeat step 2 above. For every new cleaning attempt, ALWAYS use a new wipe! 4) Repeat steps 1 – 3 for the other side of the filter if contamination exists.